All the Ohio Star rows are together! And it looks awesomely insane. Insanely awesome? I totally forgot about the backward hourglass in one of the stars. I'm going to fix it. Orderly chaos, people. The border has been picked - a penguin fabric I had stashed, with a strip of iceberg blue. To separate the penguins from the Skorca. Of course. 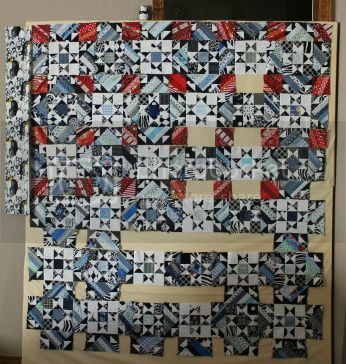 Ten more blue pieces and a good day of red paper piecing left!